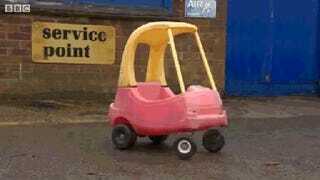 Remember the Little Tikes Cozy Coupe? Maybe you used to drive one around as a kid, Flintstones style, or maybe you knew someone else that did. Well, one man decided to supersize the iconic red toy car and make it into a real car. You can see the fully-functional (Big) Little Tikes car in this video by BBCnews. The car took over a thousand hours to make, and it goes up to seventy miles an hour. Sure, it looks kind of goofy to ride in one, but hey—it looks like a lot of fun, too.